Hard to believe it’s the middle of December already, but we’re just 14 sleeps from Christmas and for many of you a relaxing summer break. This month we’re thrilled to launch gift vouchers, and we’ve got fun travel stories, great summer events and more. Plus, we’ve got a sweet giveaway, so put away that wrapping paper, grab an eggnog and have a read. But if you haven’t booked your summer accommodation, you better get cracking. 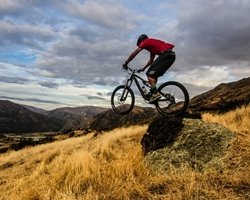 It’s looking like the busiest summer season NZ has seen in a while! Always stuck for the perfect gift for your loved ones? 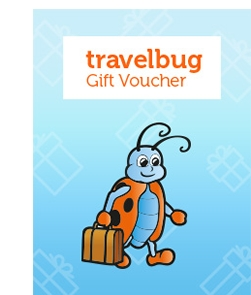 Well, be stuck no longer: Travelbug gift vouchers are here!Whether you’re looking for a small stocking filler or something a bit bigger, why don’t you give the gift of travel this year? You’ll be the toast of the family. They’re really easy to buy, just head to the gift voucher page, fill in the details and you’re done! Our biggest city has so much to offer this summer, and we’re offering one lucky person the chance to explore the City of Sails this coming January with a prize valued at $600.To be in with a chance to win a night for two at Park Regis Auckland plus a Whale and Dolphin Safari plus return tickets on the Airbus Express, you just need to tell us the name of their breakfast restaurant. Don’t miss out on our ho-ho-hotel deals! 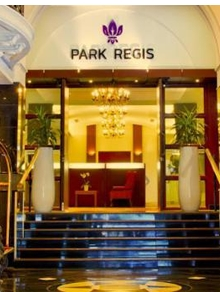 It’s not too late to get one of our sweet Christmas sale deals including a 5-star Secret Sale Auckland hotel from just $129 per night, Kingsgate Hotel Wellington for just $99 including breakfast and many more! Don’t miss out on our 12 days of Christmas facebook promotion – a new deal is live at 12pm each weekday. 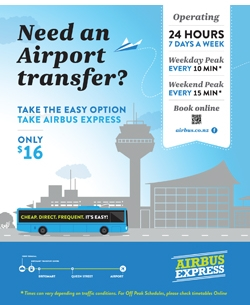 Airbus Express is Auckland’s 24 hour airport to city bus service with a direct service to/from the city stopping near most major city hotels and hostels. Airbus terminates at the Downtown Ferry Terminal next to Britomart for easy onward travel by bus, train or ferry.Tickets are available from Airbus ticket kiosks (located at Auckland Airport), i-Sites (Auckland Intl. Airport & Princes Wharf), from the bus driver (Cash only) or online at www.airbus.co.nz. Book before 31 December and get 15% off two or more adult fares – just use the discount code TRADEME14 when you book. Abandoned ghost towns of the world – who doesn’t like a good scare? Top travel destinations in 2015 – Myanmar, Mykonos and more! 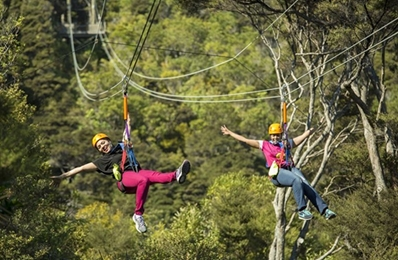 If you’re looking for something different to do this summer, you should definitely try Waiheke’s coolest activity: EcoZip Adventures. With glorious views over vineyards, the Hauraki Gulf and 800-year-old native forest, this trip will not disappoint. We headed there as a team recently and had a blast. With a wonderful mix of Kiwi hospitality, adrenalin-pumping action and native forest walk, this is an activity with something for everyone. Highly recommended! Well that’s it for this month. Don’t forget to book a room in our ho-ho-hotel sale before the end of Sunday 14 December, and make sure you buy Mum a Travelbug voucher! Have a wonderful festive season, stay safe on the roads and we’ll see you in January.